Kit out your Blackmagic Pocket Cinema 4K camera for pro-style video capture with Wooden Camera's Unified BMPCC4K Camera Cage with rubber handle. The cage protects your camera on three sides while maintaining access controls on the right grip and the camera's left side. A Manfrotto quick release system on the bottom of the cage enables quick mounting and detaching from Manfrotto-compatible tripod heads and other supports. The cage's rubber top handle offers comfortable handheld operating and can be folded down for storage. The top handle can alternately be mounted to the left vertical rod as a secondary grip. Mount accessories to the 1/4"-20, 3/8"-16, and ARRI-style threads lining the top and sides of the cage. The cage incorporates a lens-adapter support system that is compatible with most Wooden Camera and Metabones 1/4"-20 adapters. The top of the Unified BMPCC4K Camera Cage leaves the space above the camera's accessory shoe unobstructed for mounting audio accessories, such as XLR adapters. An HDMI right-angle adapter and cable clamp protect the camera's HDMI port from cable snags. 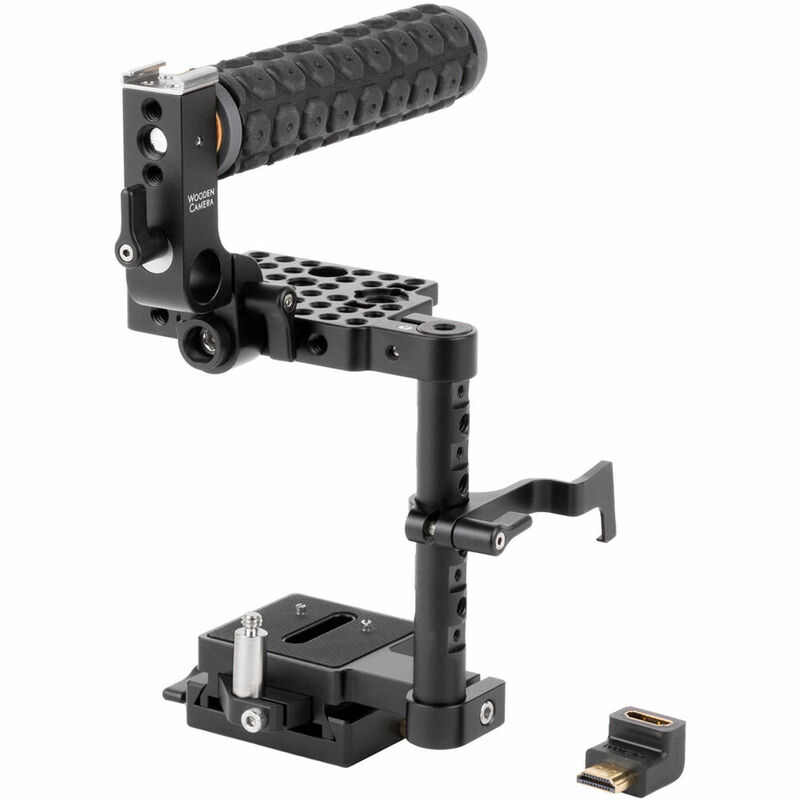 This sleekly designed cage provides 1/4"-20, 3/8"-16, ARRI mounts, and Manfrotto locating slots for your Blackmagic Design Pocket Cinema Camera 4K while maintaining access to the camera's controls. The reversible top handle has a rubber handgrip for comfortably handholding your camera. A cold shoe at the top can be used to mount a microphone, monitor, or other accessory. The handle folds down for packing and can alternately be mounted onto the left vertical rod to provide a secondary grip. Use the cage's Manfrotto quick release dovetail base to directly secure your camera to compatible plates and tripod heads. Simply turn the thumbscrew and depress the release pin to slide the plate backward out of the base. A built-in lens adapter support system provides extra support for lens adapters with a 1/4"-20 thread on the bottom, including separately available Wooden Camera PL adapters and most Metabones adapters. A right-angle adapter and a cable clamp help to secure your HDMI cable to the camera, lessening the chance of an accidental disconnection. The separately available Wooden Camera Unified DSLR 15mm Baseplate can be used to add 15mm LWS rods for accessorizing your DSLR or mirrorless camera.